Café Olé employees could still enjoy their regular hourly pay during renovations, in exchange for Little Caesar’s pizza and a helping hand. 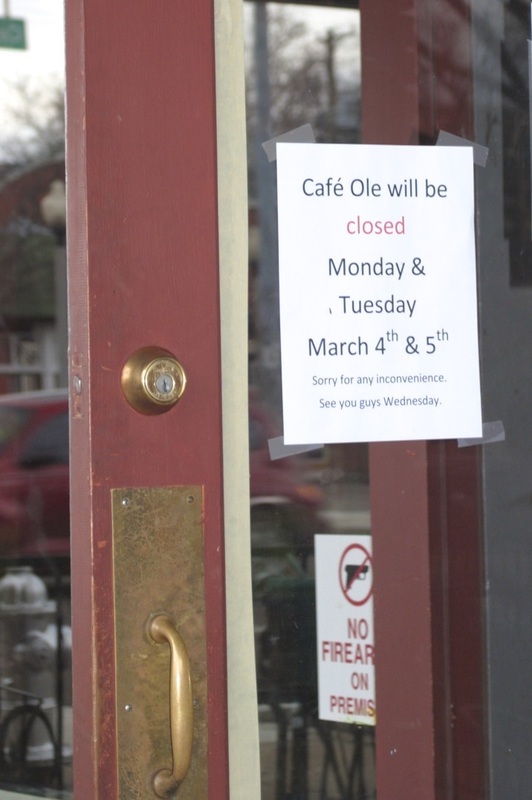 March 7, 2013 – Café Olé, a Cooper-Young casual Mexican café, closed its doors from March 10-12 to revamp their space. But the restaurant is not all that is getting a spring-cleaning. Aside from fresh wall colors and uniforms, the new menu will also offer food with American flavor, and at least 10 new margaritas starting on April 1. “It will probably be mid-April before we launch the full new menu and drinks. At least April 1, if not a little after,” manager Denise Johnson said. Some of the new margaritas will include a Caribbean, peaches & cream, hot chile, moonshine, Memphis, and cucumber. “It’s going to be more of a southwest, Caribbean drink menu,” said Tamara Cook, executive director of the Cooper-Young Business Association. Sneak peaks of the new entrées include flatbread pizza, jerk chicken on a stick and a grouper po boy sandwich. The new menu will feature Olé classics, vegetarian selections and Americanized selections. But regulars can rest assured. The Olé signature dish, the bacon wrapped stuffed shrimp, is not going anywhere. “We’re trying to give people a little more of an option if everybody at the table doesn’t want to eat Mexican. Two of our top sellers right now are our chicken sandwich and our cheeseburger. That shows us that some people want other options when they come in,” Johnson said. The Olé chicken sandwich and cheeseburger are also getting jazzed up. Customers can find the new sandwiches under the titles of avocado bacon chicken sandwich and guacamole bacon cheeseburger. The decision about what food and drinks made the cut was influenced in part by the community. Café Olé held tasting events in their restaurant, featuring all the possible new margaritas and entrées. Customers were charged a flat rate of $15, allowed to sample the items and fill out a comments sheet with their thoughts. To dine with Café Olé, visit them at 959 South Cooper St.